One of daughters is always cold…..freezing. For Christmas I made her the Vineyard Throw. It’s super warm and my intent was to give her a small, warm blanket she could wrap up on the couch with while she was reading, etc. 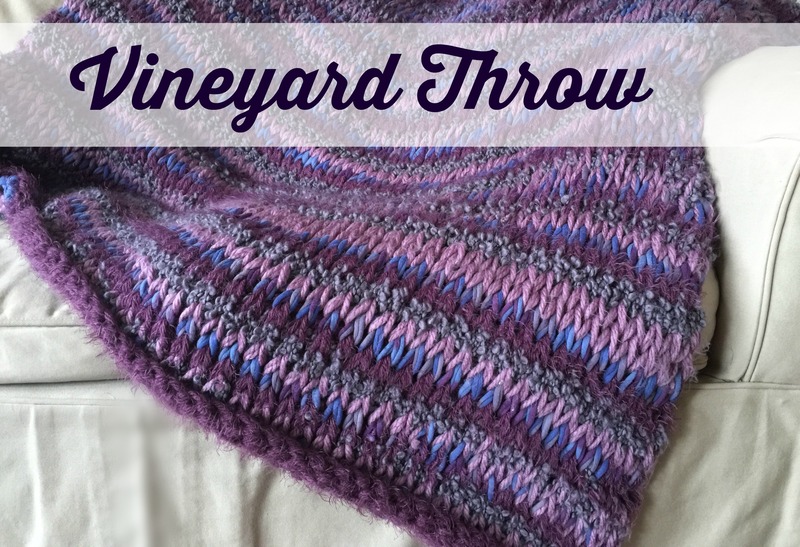 The Vineyard Throw uses Tunisian crochet. If you’ve never done Tunisian crochet, no worries, I’ll walk you through the pattern step by step. My daughter loved the blanket so much that she ended up taking it to bed and sleeping with it. I was immediately aware that she slept better than she had in years. She was never a big sleeper – like me. She would fall asleep around 10:30 or 11 pm and be wide awake at 4 am. This blanket was like one of those weighted blankets that help you sleep, only this one is better because it’s handmade! Tunisian knit stitch (tks) – insert hook from front to back between next 2 vertical bars, yo, pull up a loop. For tutorial, please see my Tunisian Knit Stitch post. Return Pass (RetP) – yo, pull through 1st loop on hook, * yo, pull through 2 loops, repeat from * across until 1 loop remains. Sc Bind Off (sc bo) – skip 1st vertical bar, * insert hook between next 2 vertical bars, yo, pull up a loop, yo, pull through both loops on hook, repeat from * across, insert hook through both loops of last stitch. For tutorial, please see my Single Crochet Bind Off post. 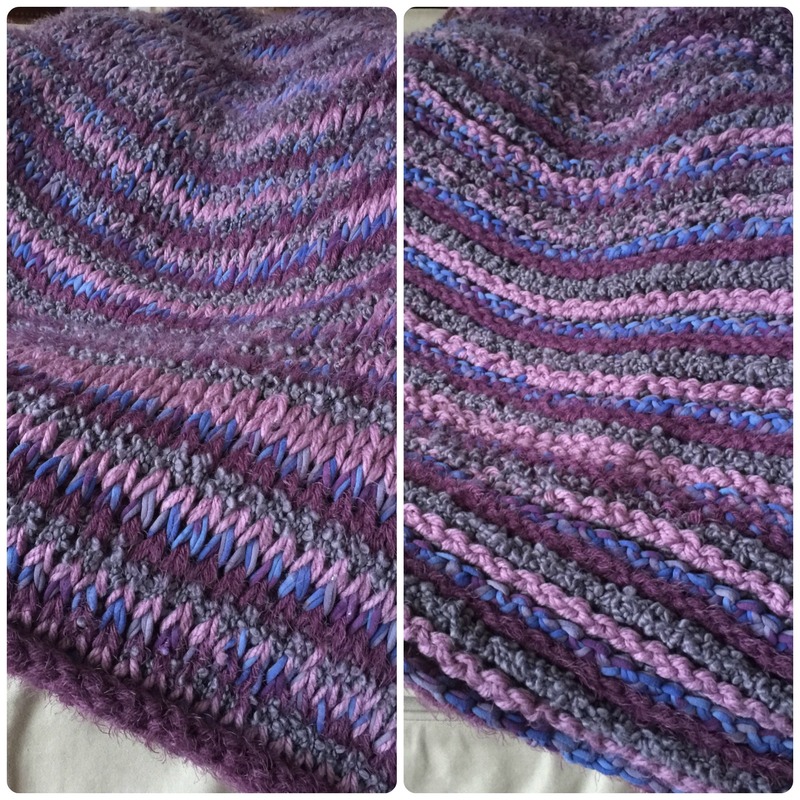 The throw is made holding 2 strands of #6 super bulky weight yarn together. By choosing a yarn that already had pattern/texture changes I avoided having to change out to new skeins even more often – which equals less ends to tie in when you’re finished. Holding 2 strands together, ch 47. Row 1: Insert hook in 2nd ch from hook, yo pull up loop, *insert hook in next ch, yo, pull up loop, rep from * across. (47 loops on hook) RetP: (see Special Stitches). Row 2: Skip 1st vertical bar, you will be working between front and back of vertical posts, *tks in next st (see Special Stitches), repeat from * across to last bar, insert hook through both loops of last bar, yo, pull up loop. RetP. Row 71: Sc bo (see Special Stitches) in each stitch across.